In the midst of the horrors brought by Hurricane Katrina in the first week of September, America was also shaken by the death of a great man: Supreme Court Chief Justice William H. Rehnquist. Most of the newspaper coverage found him euolgized him with reverence. Gone was a "courteous ... affable figure with a great poker face" (Knight Ridder), a " beloved boss...quick to crack jokes and poke fun at himself" (AP) who was "appreciated for his evenhandedness and calm" (Washington Post) and "enjoyed hosting the court's holiday party every year, leading the other justices, clerks and staffers in singing Christmas carols" (Houston Chronicle). Had Tiny Tim been at the party, no doubt the lad would have been balancing atop the Chief Justice's kindly stooped shoulders. What hokum. Rehnquist was a posturing, vain man with a penchant for humiliating practical jokes, a tyrant on the bench and known as a short-tempered bully. Rehnquist may have been a jolly caroler at Christmastime, but the rest of the year he was uncaring Mr. Scrooge, with goodwill reserved for only the rich and powerful. As Alan Dershowitz wrote on the Huffington Post, "He sometimes moderated his views for prudential or pragmatic reasons, but his vote could almost always be predicted based on who the parties were, not what the legal issues happened to be. He generally opposed the rights of gays, women, blacks, aliens, and religious minorities. He was a friend of corporations, polluters, right wing Republicans, religious fundamentalists, homophobes, and other bigots." An isolated, conservative idealogue when appointed by Nixon, later additions to the Court by Reagan forged the "Rehnquist Five" bloc that often voted along ideological grounds rather than sound jurisprudence, most famously in deciding the outcome of the year 2000 presidential election. Rehnquist led the Court in throwing out a federal law banning possession of a gun within 1,000 feet of a school, approving random drug tests for students (which he himself might have failed during his long addiction to the prescription drug, Placidyl), and allowing church-run schools to receive taxpayer-funded tuition vouchers. He voted with the 5-member majority in 1986 in declaring that gays have no constitutional rights to privacy even in their own homes. His extremist views were most on display when he was on the losing side and writing dissenting opinions that revealed his fuzzy thinking. He said flag burning should be outlawed because many people have "an almost mystical reverence" for the stars and stripes. He opposed affirmative action in college admission and a law that barred execution of the mentally retarded as "cruel and unusual" punishment. He voted against Roe v. Wade, writing "a transaction resulting in an operation such as this is not 'private' in the ordinary usage of that word." Rehnquist was such an extremist that he could even make Scalia and Thomas appear lefty, and was never shy about his desire to impose religious views on the Court. He wanted the Supreme Court to declare the pledge of allegiance constitutional, and fought to allow public displays of the ten commandments, which was his final, deathbed vote. In 1985, he wrote that there was no constitutional basis for keeping religion out of government affairs: "The 'wall between church and state' is a metaphor based on bad history, a metaphor which has proved useless as a guide to judging," he wrote. "It should be frankly and explicitly abandoned." Time has come to pity the Rove. Here poor Karl has devoted over a decade to burnishing the image of George W. Bush as America's competent, compassionate Dear Leader, only to find his life's work on wobbly legs following Hurricane Katrina. Nine days afterward, polls showed about 3 of 5 disapproved of his job on disaster relief, a complete opposite of figures from the week before. Bush approval ratings sank below 40 percent for the first time. Surely Rove blames the heavy media coverage of New Orleans' unrelenting misery, but Bush made his own mistakes. First there was the photo of him clowning with a guitar even as disaster struck, inviting easy comparisons to Nero and fiddles. Then there was the president's comment that no one foresaw the levee's collapsing, when it was clear that everyone predicted exactly that. And then there was this remarkable exchange on September 6 as later told by Rep. Nancy Pelosi, who urged him to ax FEMA director Michael Brown. "Why would I do that?" Bush asked the House Democratic Leader, "what didn't go right?" Pelosi commented to the press, "Oblivious, in denial, dangerous." The federal government's disgracefully laggard response to the emergency is reason enough for anger at the Bush administration, but it was their refusal to budget simple, inexpensive flood control projects that turned the storm's damage into a catastrophe. Funding began to dry up in 2003, with the money being diverted to the Iraq War. Each year since, the situation has steadily gotten worse. The White House earlier this year promised Louisiana only $10.4 million for its chief hurricane protection project -- a sixth of what was needed. The Army Corps of Engineers were denied $4 million for a four year study on protecting New Orleans from a category 4 or 5 hurricane and ordered to forget about starting any new studies for the region (MORE on federal funding issues). Another main factor was the pitiful condition of Lousiana's wetlands, which normally buffer the powerful waves of hurricanes. 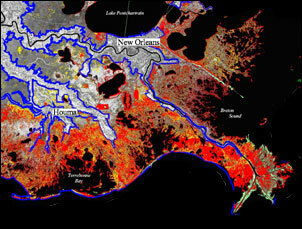 Since 1930, Louisiana has lost 1,900 square miles of coastal wetlands, and continues to lose another 35-40 sq. miles every year -- the equivalent of an acre of land every 35 minutes. Politics are to blame here, too; for years, Louisiana, the Army Corps, and enviros have failed to get Congress to seriously consider a three-decade, multi-stage plan for restoration. If all that coastland hadn't been lost over the years (see map to right), New Orleans probably wouldn't have taken such a wallop. ...The Bush administration's policy of turning over wetlands to developers almost certainly also contributed to the heightened level of the storm surge. In 1990, a federal task force began restoring lost wetlands surrounding New Orleans. Every two miles of wetland between the Crescent City and the Gulf reduces a surge by half a foot. Bush had promised "no net loss" of wetlands, a policy launched by his father's administration and bolstered by President Clinton. But he reversed his approach in 2003, unleashing the developers. Probably by coincidence, Molly Ivins wrote much the same thing in her column about Hurricane Katrina published the same day. "It is a fact that the Clinton administration set some tough policies on wetlands, and it is a fact that the Bush administration repealed those policies -- ordering federal agencies to stop protecting as many as 20 million acres of wetlands," she wrote. "...Bush administration's policies had allowed developers to drain thousands of acres of wetlands." But in this one instance, Bush is getting a bad rap; as experts from three Gulf wetlands restoration groups told MONITOR this week, there's been no rampant development in the areas in question, because of Bush policies or no. The only construction anyone could think of that might have somewhat worsened flooding was in shorline Lake Pontchartrain communities such as Slidell. You can certainly charge Bush with neglect of the Louisiana wetlands, but the damage there was caused by ongoing abuse, particularly short-sighted "improvements" to the waterways for navigation. The other major cause of the loss of Louisiana's wetlands has been the result of oil and gas extraction activities. "The energy industry has placed pipelines and dug channels through the marsh to convey oil and gas to its processors and transporters," explained Susan Kaderka, Director of the Gulf States Natural Resource Center for the National Wildlife Federation. "These channels have allowed salt water from the Gulf to intrude into freshwater marsh areas, killing off vegetation that is not used to salt water. As the vegetation dies, the soil it was holding in place just slips away, and what was once a continuous marsh becomes a sort of swiss cheese pattern, with large areas of open water." It's important to note that Blumenthal, Ivins, and others that have since mentioned Bush's damage to wetlands are also fundamentally correct, when it comes to the rest of the country. Changes in 2003 to the Clean Water Act eliminated the need for permits when wetlands are destroyed or polluted, as long as the area is within a single state and not part of a navigable waterway. That almost all Louisiana wetlands are connected to lakes, rivers, or the Gulf spared them from the loophole. Bush has also perverted the Conservation Reserve Program into a giveaway for big agribusiness. The original CRP, which began in 1985, became a major conservation program that reversed the loss of wetlands. It now includes 800,000 more acres of grassland, border farmland, and non-floodplain wetlands. And here's the ugly catch: Those lands will also be exempt from any environmental protection. This might allow a slaughterhouse, for example, to not only dump animal waste in a seasonal wetland (Bush calls 'em "Prairie Potholes") without worry of government penalty, but also be paid about $60/acre for the pleasure.